Is There A Place for AI in Small to Medium Businesses? Many small to medium business owners view artificial intelligence as something only huge corporations need. In reality, it can help position them to compete with those corporations on a whole new level. It seems like everyone in the business world is launching artificial intelligence programs. That’s partly because nearly everyone is. 61% of businesses have already begun using some form of artificial intelligence, many of those focusing on predictive analytics and machine learning. 71% report they plan to expand their use of predictive analytics and other AI applications over the next year. For most companies the decision to adopt AI is an easy one. For small to medium businesses (SMBs), though, there are tough questions to answer. Even successful SMBs don’t have the same depth of financial resources as a multinational corporation. They need to invest cautiously, and artificial intelligence can sound like a science fiction daydream. That’s unfortunate, because artificial intelligence is fast becoming the kind of tool that can help small to medium businesses keep up with their larger competitors. Read on to explore the things keeping SMBs from investing in artificial intelligence. then find out how to get past them and what technologies are best suited for small to medium businesses. “Artificial Intelligence” brings to mind futuristic robots and complex movie plots, but the reality is much simpler. The term refers to teaching machines to “think” and interpret information like humans do. Humans have very flexible minds. They can handle a variety of rapidly-changing topics and navigate difficult conditions that confuse computers (although computers have a greater ability to process repetitive data quickly and accurately). Modern artificial intelligence has come a long way. It can’t quite mimic human thought yet, but there have been some exciting advances using AI techniques like machine learning and deep learning that show potential for nuanced processing. The technology is proving its value as an enterprise tool, too. Even as larger companies move to wider integrations of artificial technologies, small to medium businesses are slow to adopt. Their hesitation is understandable – after all, a failed technology project could threaten the future of their company – but it also holds them back. The truth is, many of their concerns aren’t as serious as they think. The issues have practical workarounds or can otherwise be mitigated through proper planning. Here’s why the leading reasons SMBs aren’t adopting artificial intelligence don’t have to be unmovable roadblocks to progress and how they can be overcome. Industry news reports tend to cover high-end artificial intelligence ventures done by major international corporations, with price tags in the millions (or occasionally billions). That kind of investment is an intimidating prospect for an SMB who just needs a better way to utilize their data. The thing is, those programs usually involve the most difficult and expensive forms of AI. Experimental programming, complex interactions, sensitive health information, government-regulated data, huge amounts of simultaneous users, and other complicating factors raise the costs above the average for enterprise AI projects. SMBs don’t need the same amount of scale or infrastructure. Their modest needs can be met at a much more reasonable price point. There is no “usual” price for AI. The costs associated with artificial intelligence are based on many factors, including safety and regulatory protocols and the complexity of necessary interactions. Does the program need access to sensitive information? Is it designed to address a specific set of circumstances or is it more a broad-spectrum tool? What level of interaction with humans is desired? Will the AI need to perform complex actions? Even when a full artificial intelligence program is out of reach, there are ways to integrate AI on a limited budget. For one thing, AI is included in many enterprise software packages. Most companies already have access to some AI tools, even if they don’t realize it. Targeting tools in email marketing software and personal assistants on smartphones are both driven by artificial intelligence. More in-depth AI toolsets are often available with a reasonably-priced software upgrade to enterprise level from free or lower-tier accounts. It’s work checking with vendors to see what’s within reach. The rise of reusable code and powerful development frameworks has put small-scale custom solutions within reach, as well. Developers have platform options for creating analytics dashboards and chatbots that makes the costs approachable for SMBs. Project failure is a daunting prospect for SMBs, who usually have a longer list of desired business improvements than they have capital to spend. They need to prioritize projects because they can’t do everything they’d like. Investing in AI means putting another project on hold, something they aren’t willing to do when it seems like all they hear about is failed artificial intelligence projects. It’s easy to become discouraged by high-profile AI failures or assume tools are overhyped, because some projects do fail and some tools are overhyped. Artificial intelligence is at a point in the Hype Cycle where its applications are being rigorously tested, and some won’t make it through to becoming everyday technologies. However, project failure is more often an organizational issue instead of a technological one. A weak discovery process results in a weak final product. Internal adoption rates are too low to realize the project’s potential. Misaligned business goals lead to the company creating a product that no longer fits within their workflows. The company experiences an outsourcing failure or developer issues. Avoiding these issues is somewhere small to medium businesses may have an edge over larger corporations. Why? Pushing internal adoption on a small team is more effective because the company leadership can personally talk to everyone (or at least every team leader) to convince them of a project’s value. There is less opportunity for confusion over business needs and goals. The development process has fewer moving parts, so it’s easier to make needs clear during discovery. What SMBs need to watch out for is the tendency to default to the lowest bidder, especially when outsourcing overseas. If they focus on quality as much as price, they’re more likely to get a quality return on their investment. Choosing Agile development methods is another way to ensure a positive outcome. Developers who use Agile and conduct a thorough discovery are actually seeing a rise in project success rates, and have been for a couple of years. AI isn’t practical for a small to medium business; it only works for massive corporations. Many SMB owners see AI as something that can’t help their business. They assume they don’t have enough data to process or that the impact of AI won’t be noticeable at a smaller scale. A lot of those same owners would be surprised to realize how much data they already have – data which is going untapped. Putting that data to work might result in smaller gains, but proportionately those gains matter more. One interesting thing about AI is that is has opposite benefits for SMBs and larger companies. It helps giant companies operate with the personalization of an SMB while allowing SMBs to function with the efficiency of a massive corporation. That is, it gives small to medium businesses the edge they need to “punch outside their weight class” when it comes to competing for market share. While there are some AI applications that won’t help smaller-scale businesses, there are many more that will. A small bookshop with five employees wouldn’t get value from predictive scheduling software, but they could see an impressive return on predictive ordering and email marketing programs. There’s a perception that artificial intelligence is only for high-tech fields like software development or banking. That couldn’t be farther from the truth. 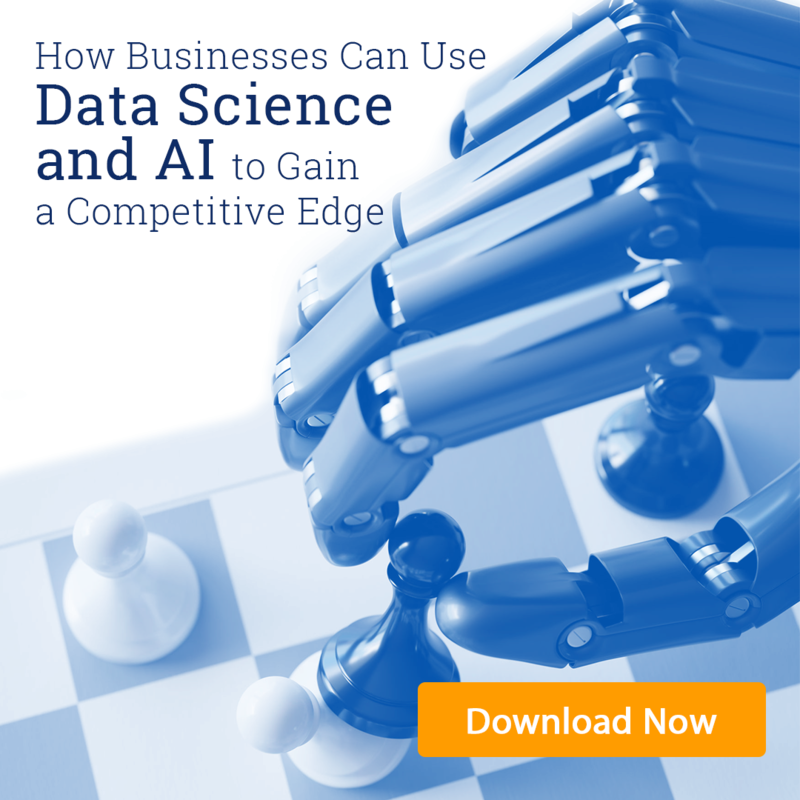 AI can be applied anywhere where data is generated – that is, everywhere – to improve efficiency, guide decision making, and maximize the impact of marketing and sales campaigns. A cleaning company uses AI to intelligently manage their leads and upsell current clients. A stroller rental company builds an AI-powered solution to manage their inventory and give customers more options for customizing deliveries. A vacation rental agency uses price optimization to get the best possible pricing on rentals for owners. A landscaping company decides where to expand based on data gathered from predictive analytics tools. These are all small but important decisions, and they’re made easier using insights gathered by artificial intelligence. SMBs tend to have long-time employees in leadership positions with lower turnover in mid-level roles. They often hesitate to push something that seems high-tech or confusing due to established relationships with employees. These fears are large unfounded. Building enterprise AI tools is complicated. Using them is less so, especially with custom tools created specifically for non-technicians. Most enterprise AI software is designed to be user-friendly at an operator level, so the on-boarding process would likely be much less complicated than SMBs might expect. Where there are problems, there are well-established training solutions. The most popular AI tools have online classes at a variety of price points, from free YouTube tutorials to subscription-based professional development platforms. Developers generally offer training and support packages for their software at reasonable rates. With so many options even the most technophobic staffer can find a way to get on board with new tools, especially once they realize how much easier AI makes their job. Larger companies are already investing in artificial intelligence. As they do, they’re gaining a lot of advantages traditionally enjoyed by SMBs, like personalized service and shorter response times to changing local market conditions. Small to medium businesses have a choice. They can make the AI investment that will help them stay competitive or risk losing their customer base to larger, better-informed companies. At the end of the day, that isn’t much of a choice at all. Artificial intelligence doesn’t have to be a headache. Concepta can help you build an intelligent business intelligence solution that fits your needs- and your budget. Schedule your complimentary appointment today! Of all the artificial intelligence applications making their way into enterprise, one of the most effective is predictive analytics. It has the potential to transform the decision-making process from something based on “gut instincts” and historical trends to a data-driven system that reflects actual current events. Those who have adopted it are outperforming their competitors at every turn. Some organizations still hesitate to launch their own predictive initiatives. Artificial intelligence has been a buzzword for decades, and many times in the past it failed to deliver on its promises. Executives with an eye on the bottom line might avoid any kind of AI technology out of understandable skepticism. That hesitation could be holding these companies back. Predictive analytics has matured into a viable enterprise tool. It’s being used all over the world to find opportunities for growth. The impact is so striking that 71% of businesses are increasing their use of enterprise analytics over the next three years. Read on to learn more about predictive analytics, what it offers for enterprise, and how it can drive a measurable increase in revenue. What Does “Predictive Analytics” Mean? Predictive analytics is the practice of analyzing past and present data to make predictions about future events. Technically it can describe any process that seeks to identify the most likely scenario by drawing parallels between historical and current conditions, then placing those conclusions in a modern context. Analysts look at what happened in the past when conditions were similar and how certain events played out. They assign more weight to factors which have tended to be more influential or which have greater potential for an extreme outcome. Most people assume predictive analytics is a recent invention, something that arose after computers established their role in enterprise. In reality, businesses have been relying on it since the late 1600s, when Lloyd’s of London began applying the practice to their shipping insurance estimates. In pre-artificial intelligence days, people used statistical modelling and complex mathematical equations to perform predictive analytics. Many updated versions of those models are still in use for industrial shipping and route planning. Non-intelligent methods have limitations, though. They only consider factors users decide to include, so there’s a heavy likelihood of human error and bias. It also takes time to perform the calculations. By the time they’re done and put into use the data is already becoming outdated. The modern style of predictive analytics incorporates artificial intelligence and machine learning. It allows users to include many more variables for a broader, more comprehensive analysis. The process highlights unexpected connections between data and weighs factors with greater accuracy. All of this can be done with a short enough timespan to create timely, reliable insights. AI and machine learning have exciting potential, but like all emerging technology they require investment. Global brands like Google might have the resources to shrug off a failed project. For the majority of organizations, though, there has to be a reasonable expectation of profit to consider launching a technology initiative. Successful enterprise leaders aren’t reckless with their IT budgets. They focus on actual business goals and source technology that addresses those instead of trying out popular new tools. Predictive analytics has an answer for that question: growing revenue through refined opportunity scoring. Opportunity scoring involves assigning a value to a sales lead, project, goal, or other potential course of action in order to determine how much relative effort to spend in pursuit of that opportunity. Scoring opportunities allows a company to get a greater return on their time and money. No company can put the same investment into every customer or chance that crosses their path. They shouldn’t even try. 80% of revenue comes from 20% of clients, so it makes sense to prioritize that 20%. It’s something every business does, even if there isn’t a standardized process in place. High value sales leads are called frequently, given more flexibility with concessions, and assigned better sales representatives. High value projects get bigger teams, more access to resources, larger budgets, and scheduling priority. The trick is deciding what opportunities have the most potential- and that’s where predictive analytics come into play. Two main types of opportunity scoring methods are in widespread use today: those that are done manually and those that take advantage of machine learning. Manual scoring is where people assign scores, either personally or using a statistical model, based on their own set of influential characteristics. There are a number of problems with this method that can slow businesses down or leave them with unreliable scores. Opportunity scoring is incredibly valuable- when it’s reliable. Manual scores have a wide margin of error. They depend on direct user input with no ability to suggest other relevant factors. Unlike intelligent scoring, manual methods can’t easily be used to find unexpected commonalities among high-return accounts. The problem with this approach is that executives can’t realistically imagine or keep track of everything that might influence their company. There’s too much data to consider, and it changes constantly. All manual opportunity scoring is therefore based on aging, less useful data. On top of that, it’s easy to make mathematical mistakes even with a computer program’s assistance. Because users choose and weigh the contributing factors, manual scoring is highly susceptible to human bias. Preconceptions about social categories, personal characteristics, industrial domains, and other identifying factors can be given too much (or too little) weight. It allows for unhelpful biases to be introduced into the sales cycle. Most of the time the result is simply less helpful scores, but it does occasionally create a public relations issue if the scoring system leads to operational discrimination. For example, some real estate brokers have run into a problem where one racial group wasn’t shown houses in a certain area. The company’s scoring suggested those groups were less likely to buy there. The realtors thought they were following good business practices by relying on their internal customer scoring, but those scores were skewed by biases about economic stability rather than actual data. When the situation came to light it created a public impression that the realtors had the same bias. Suddenly they had bigger worries than opportunity scoring. Creating and maintaining a manual scoring process takes a significant chunk of time. It’s not a system that responds well or quickly to change. That’s a problem in today’s hyper-connected world, where an event in the morning could start influencing sales across the country that afternoon. Opportunities wind up passing before they’re even recognized. Not everyone remembers to consider “hidden costs” of ineffective processes, like higher labor. Tedious data entry takes time and focus away from more productive sales activities without a corresponding return on value due to the lower accuracy. There’s human nature to consider, as well. Sales teams can tell these scoring systems aren’t effective. It’s not uncommon for teams to resist wasting time they could be working leads. They don’t like putting their commissions at risk with bad information, but still need some kind of guidance to help manage their lead interactions. More often than not, they operate with outdated scores or “gut instincts”. That in turn frustrates managers who have invested in the inefficient manual scoring process. The conflicting pressures create an uncomfortable working environment that drives unwanted turnover among the most valuable sales agents. Even the most sophisticated manual scoring program can only account for things that have been specifically input into the equations. They require humans to think of and assign value to every possible factor. This tends to enforce a “business as usual” mindset over more profitable responsive operations. On the flip side, predictive opportunity scoring is among the leading AI-based drivers of revenue in an enterprise context. It has the edge over other methods in several areas. There are two central reasons behind the higher reliability of intelligent scoring. First and foremost, it reduces the impact of human error. Machine learning algorithms perform calculations the same way every time. Even as they adjust themselves in response to new data, the underlying math is more reliable than calculations done by humans. It’s also important that predictive analytics is purely data-driven rather than focusing on “traditional knowledge” about what makes an opportunity valuable. Artificial intelligence expands a computer’s capacity to judge the relevance of seemingly unconnected events. Predictive analytics leverages that capacity to identify characteristics shared by highly productive courses of action. Those commonalities are then used to weigh future opportunities with a greater degree of accuracy. Predictive analytics fed by a constant stream of new information allow predictive opportunity scoring tools to update scores in real time (or at least near-real time). They highlight opportunities in time for companies to take action. Advance warning also leads to better advance planning when it comes to inventory, staffing, and marketing. Intelligent scoring tools react to actual circumstances based on data instead of presumptions. They consider all data available for a situation from an impartial standpoint (providing, of course, that any developer bias is accounted for during design). The majority of enterprise analytics software is designed to be user-friendly and easy to operate. It connects to a company’s data sources, meaning there’s usually very little data entry required. This frees the sales team to focus on their accounts and other high value activities. There’s a saying that 80% of revenue comes from 20% of clients. Lead scoring helps identify that 20% so sales teams can focus on the most valuable customers. Agents close more contract- and higher value ones- when they know where to profitably spend their time rather than chasing a weak prospect for a low bid. Intelligent lead scoring is a dynamic process, meaning it regularly reevaluates leads based on changing circumstances. A client marked as a low priority lead moves up as indicators show rising interest. Agents then step in at the right point in the purchase cycle with a targeted incentive to encourage a sale (or even an upsell). Customized attention has the added benefit of increasing repeat business, because former clients aren’t bombarded with high-pressure closing tactics when they aren’t ready to buy again. When executives know where advertising has the most potential impact, they have more options for strategic spending. Specific demographics can be targeted with tailored campaigns to increase their lifetime value, keep them from falling out of the sales cycle, or meet another specific business goal. Information can travel around the world near-instantly, but inventory still has to be physically moved. That puts a natural drag on rearranging supply levels in different regions – and with it, a cap on how much companies can exploit regional fluctuations in demand. This causes lower sales in general, but the effect is most striking during an unexpected surge in demand. Predictive analytics can spot early indicators of a potential spike while excitement is still building. Executives have the warning necessary to shift goods and team members where they’re needed most. Amazon uses this method to stage their merchandise for faster shipping of commonly ordered items. Opportunities aren’t always about marketing campaigns or scoring leads. Sometimes executives want guidance when choosing between growth strategies. Which stores will be most valuable over the next year? Where should the company expand? Should more franchises be sold in a specific area? What ventures are most likely to succeed? Is a specific project worth the investment? There’s no guarantee that any course of action is the best, but incorporating data cuts out many of the risk factors that lead to failure (such as hype over new technology or personal bias). At the end of the day, data is only valuable when it serves real-world business goals. Opportunity scoring is one of the most proven ways to extract value from data. It’s also one of the most accessible, since embedded analytics are built into the majority of modern enterprise software. With so much to gain at a relatively low investment point, those who haven’t adopted yet should be giving predictive analytics a closer look. Are you frustrated by trying to navigate multiple streams of data? One of the most common pain points of data intelligence initiatives is reconciling data from the enterprise software used by different departments. Concepta can unite data from programs like Salesforce, MailChimp, and other analytics programs to put data where it’s needed most- in your hands! Predictive analytics is increasingly accepted as a way of improving the customer experience or optimizing supply lines, but it’s underutilized in one area: forecasting labor costs. That goes double for sales staff that work on commission. Managers need to be able to predict their commission expenses, but the qualities that make sales staff good at selling make them bad at predicting which deals will close. Their optimism is a problem for CFOs trying to forecast expenses. Enter predictive analytics, the voice of reason that brings hazy forecasts back in line with reality. Executives can use tools already at work in other areas of the company to better prepare for the future. How? To understand, start with the specific difficulties of predicting commissions and then see what a predictive analysis does differently. Use the first months of a year to create a fixed monthly estimate for rest of the year. This method is easy to use but not very accurate. Fixed monthly estimates don’t account for season, labor fluctuations, product changes, and other factors. Use the previous year’s monthly commissions as monthly estimates. Previous-year totals are as easy to manage as fixed monthly estimates. They’re also more accurate since they reflect seasonal influences and company-specific trends. What they miss are allowances for outside influences (market fluctuations, new competitors, supply problems) or internal change (new staff, commission structure changes, mergers). Rely on sales staff predictions to project expenses. Good salespeople are often bad forecasters. 54% of deals predicted by sales staff never close because agents tend to be unwilling to admit defeat on a sale. In addition, staff paid through commissions have little incentive to accurately forecast since doing so takes up time they could be selling. Sales numbers help project revenue. Staff performance data informs human resources processes. Market factors are useful in optimizing the supply chain and spotting opportunities. Predictive models don’t replace the sales staff in forecasting, but they do provide incentives for participation. When the data they submit is accurate salespeople are rewarded with results that identify which clients are most useful, where their time can be spent most profitably, and what commissions they can expect throughout the year. That promotes large-scale support of predictive methods within the company. Consistent internal adoption increases the ROI on technology investments. In short, extending predictive analytics into the accounting realm can positively affect overall profitability and performance. Savvy CFOs should investigate how their processes might be improved by embracing predictive analytics. An intuitive, easy-to-navigate interface makes predictive analytics accessible to everyone, not just the CIO and IT. Contact Concepta to learn about our custom analytics dashboards! Lead scoring is a key part of the marketing process, so it’s not surprising that it’s also an area where predictive analytics has a major impact. Predictive lead scoring pushes the utility of data forward to the Sales Department in the form of actionable insights. Let’s take a look at how this technique translates into increased revenue. Using the traditional method of lead scoring, the CMO or another executive creates a list of traits which are perceived to increase the likelihood of conversion. Each trait is assigned a positive or negative modifier based on how much it could affect the customer’s value. Some examples of positive qualities are working within the company’s primary target industry, holding a high-level position in the C-suite or with decision-making authority, expressing interest in the product by filling out online requests for information, or attending relevant trade shows. Traits that are assumed to lessen a lead’s value include holding a position with no purchase authority, a mismatched income bracket for target market, and living too far from the company’s physical stores to shop regularly. Once all points are assigned the total is calculated, then used to evaluate whether the lead is worth passing to sales team. The score can also indicate a lead’s priority (should it be moved in front of other sales calls or does it need to mature?). Predictive lead scoring (sometimes shortened to PLS) is much less subjective. An algorithm analyzes data on existing customers along with their performance, creates a formula to weigh characteristics that are demonstrated to influence customer behavior, and applies that to incoming leads to predict customer value. The marketer doesn’t create the list of “desirable characteristics.” Instead, the algorithm identifies the most relevant characteristics through techniques like clustering. It estimates not only potential lifetime value but also where a customer is in the buying cycle. The predictive method is finding favor with marketers, and for good reason. It has a number of advantages over traditional lead scoring. Acts on data rather than guesswork: PLS removes the bias factor in deciding what is and isn’t relevant. There is still some potential for programmer bias, but generally enough people work on enterprise software to reduce that risk. Considers implicit as well as explicit data: Explicit data such as business titles and whether a lead has a company email are useful, but they only tell part of the picture. Much more can be gleaned from implicit data: posting in trade forums, downloading related publications, interacting with certain content on the company’s website. These are telling signs that a customer is moving forward in the buying cycle. Works at scale: Automated lead scoring processes vastly more data than traditional methods. Companies that use it are able to adjust relatively quickly to new or expanded markets, giving them a competitive edge over their rivals. Highlights optimal marketing channels: Knowing what actually matters to customers makes campaigns exponentially more effective. Marketers can target their best customers through the channels that matter most to them. Suggests tactics to prevent churn: Predictive lead scoring identifies areas where customers fall out of the buying cycle so CMOs can address those weak points. At its core, predictive lead scoring is about prioritizing accuracy and efficiency. PLS zeroes in on the traits that have a measurable impact on lead performance, leading to more revenue and less hours wasted on weak leads. How can your data help identify your best leads? Contact Concepta to learn more about our business intelligence and data science services!